Inhibits calcium transport into myocardial and vascular smooth muscle cells, suppressing contractions. Dilates main coronary arteries and arterioles, inhibits coronary artery spasm, increases oxygen delivery to heart, and reduces frequency and severity of angina attacks. Adults: For acute angina attack, 0.3 to 0.6 mg S.L., repeated q 5 minutes for 15 minutes p.r.n. ; or one to two trans-lingual sprays, repeated q 5 minutes for 15 minutes p.r.n. For long-term or prophylactic use, 1-mg extended-release buccal tablet q 5 hours, with dosage and frequency increased p.r.n. ; or 2.5 to 9 mg (extended-release tablets) P.O. 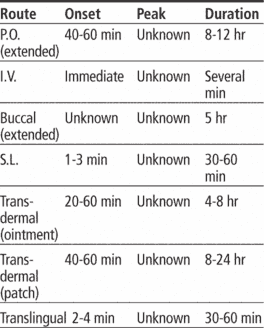 q 8 to 12 hours; or 1.3 to 6.5 mg (extended-release capsules) P.O. q 8 to 12 hours. Adults: 12.5 to 25 mcg I.V., then a continuous infusion of 10 to 20 mcg/minute q 5 to 10 minutes; increase by 5 to 10 mcg/minute q 5 to 10 minutes as needed to a maximum of 200 mcg/minute. • Administer tablets and capsules with water. Don't crush, break, or let patient chew them. • For S.L. use, administer under tongue or in buccal pouch; instruct patient not to swallow tablet. For acute angina, give at pain onset. For angina prophylaxis, give before activities that may cause anginal pain. • For translingual use, spray directly onto oral mucosa. Don't let patient inhale spray. Give at pain onset and as needed prophylactically before activities that trigger angina. • For transdermal use, apply system to skin site with little hair and movement. Don't apply to distal extremities. Rotate application sites to avoid irritation and sensitization. • Apply transdermal ointment to skin by spreading prescribed amount over 6″ × 6″ area (using an applicator, not your fingers). Cover area with plastic wrap and tape. Rotate sites to reduce risk of irritation and inflammation. Don't mix solution for injection with other drugs, and don't give by direct I.V. injection. • Be aware that solution for injection is affected by type of infusion set used and that dosage is based on use of conventional PVC tubing. When using nonabsorbent tubing, reduce dosage. • For I.V. use, administer with infusion pump. Increase dosage in increments of 5 mcg/minute every 3 to 5 minutes p.r.n. to achieve desired blood pressure response. Once achieved, reduce dosage and lengthen dosage adjustment intervals. Don't give concurrently with sildenafil (may cause life-threatening hypotension). With I.V. use, monitor blood pressure frequently. Titrate dosage to obtain desired results. • With transdermal use, check for rash or skin irritation. • Monitor patient for angina relief. • Instruct patient to place S.L. tablet directly under tongue and hold it there as it dissolves. Caution him not to chew or swallow tablet. • Tell patient to use drug before physical activities that may cause angina. • Instruct patient to take drug at pain onset and repeat every 5 minutes for three doses. If pain doesn't subside, advise him to seek medical attention. • Tell patient not to chew or crush sustained-release tablets. • Advise patient to apply correct amount of ointment using applicator. Caution him to avoid rubbing site. Instruct him to cover ointment with plastic wrap and tape it, to wash hands after placement, and to rotate sites. • Advise patient to consult prescriber or pharmacist before changing brands of transdermal system. Different brands may have different drug concentrations. • As appropriate, review all significant and life-threatening adverse reactions and interactions, especially those related to the drugs, tests, and behaviors mentioned above. offers the Pumpspray Money Back Guarantee, which enables patients to try Nitrolingual Pumpspray - knowing that if they are not completely satisfied, the Company will reimburse them for the out-of-pocket amount they paid for the prescription. Our licensor/supplier can terminate our rights to commercialize Nitrolingual and the 60mg dose size of this product has not yet met our expectation. Our licensor/supplier can terminate our rights to commercialize Nitrolingual and the 60 dose size of this product has not yet met our expectation. Net revenues of the Company's Cardiovascular/Diabetes products, which include Sular, Triglide, Fortamet, Nitrolingual Pumpspray, and Altoprev, increased 4.